Yesterday, speaking of our politics, I cited to Zeynep Tufekci, who advises us that political "protests," as manifested by large demonstrations in the street and public square, are not, in and of themselves, going to change our current political reality. It is what happens "afterward," after the protest, and not the size of the protest, that will make the difference. Our new President is Donald Trump. The election is over. "Afterward" is now. So, what shall we do? This is not an easy question, because it is clear that our political world has been "broken" in a very fundamental way, and that the repair of our political world is not going to be easily accomplished. It will certainly not be repaired by marches and protests, as Tufekci tells us. I think it is fair to admit that it was not the election of Donald Trump, alone, that "broke" our politics, but the election of Donald Trump most definitely revealed how broken our politics has become. The "break" in our politics MUST break "us," too, or we will suffer the fate outlined in the second part of the Hemingway quote. If our routines, our normal lives, are not "broken" by what has happened in our political world, then our politics will die. There may be no special hurry, but that is what the fate of self-government in the United States will be if what has happened in the November 2016 presidential election does not break us out of our current lives and current routines, and by doing so, provide us an opportunity to rebuild our fractured politics with the strength that can survive any subsequent assault. I pull no punches. Hemingway didn't either. 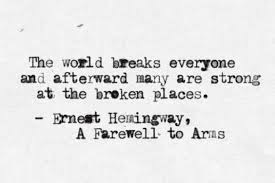 "Death" will be the fate of our democracy unless we take Hemingway's advice and "break" ourselves, break our routines, break free from the lives we have led, the lives we have loved. If we do nothing new, now, we know what happens "afterward."